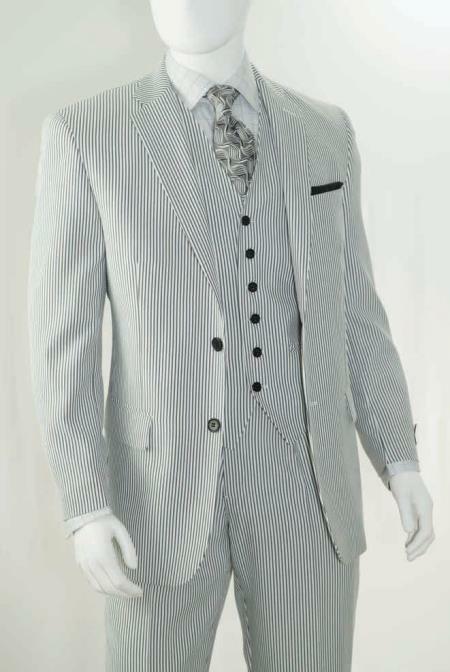 For years, men wore a variation of the white three-piece suit. The upper-crust men of the day love to wear their 1920s formalwear. Men were into changing clothes several times a day. 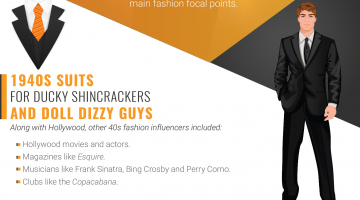 Young men put some fashion distance from those staunch blokes. They wore baggy, wide-legged white trousers and slim white suits with unpadded jackets during the summer months. 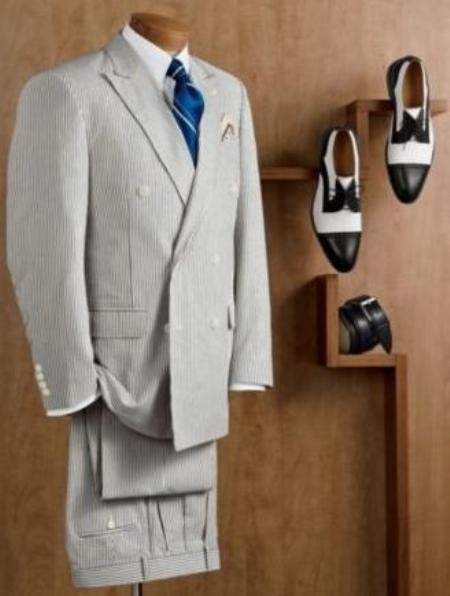 Suit fabrics and colors got lighter in the 1920s. The World War was a catalyst for economic and social reforms. Fashion did its best to express those changes. One of the most interesting changes in fashion during the 1920s was the emergence of the six-buttoned, double-breasted, white linen suit. It was a mark of distinction and wealth. 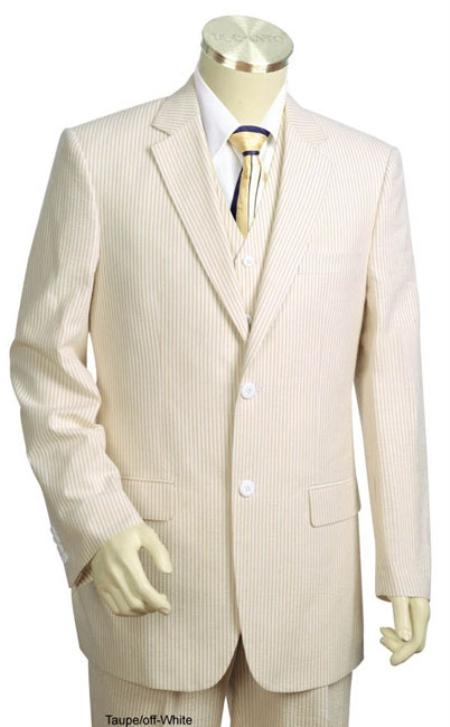 F. Scott Fitzgerald gave the white suit a state of prominence in 1925, when his book, The Great Gatsby was published. To say the white suit has withstood the test of time would be an understatement. The Great Gatsby white suit is a fashion icon. 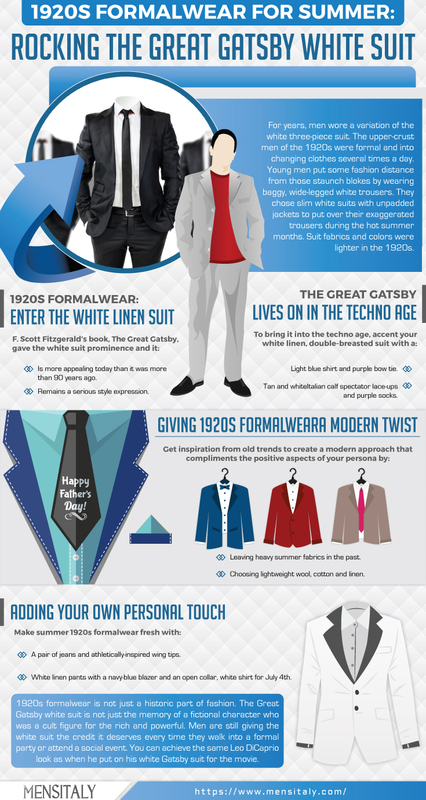 The three-piece white Gatsby suit is more appealing today than it was more than 90 years ago. 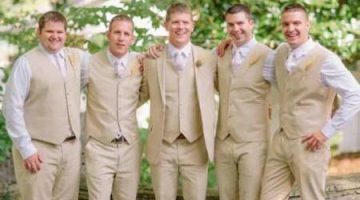 The white three-piece suit was 1920s formalwear, but wearing a version of that suit today is a serious style expression. 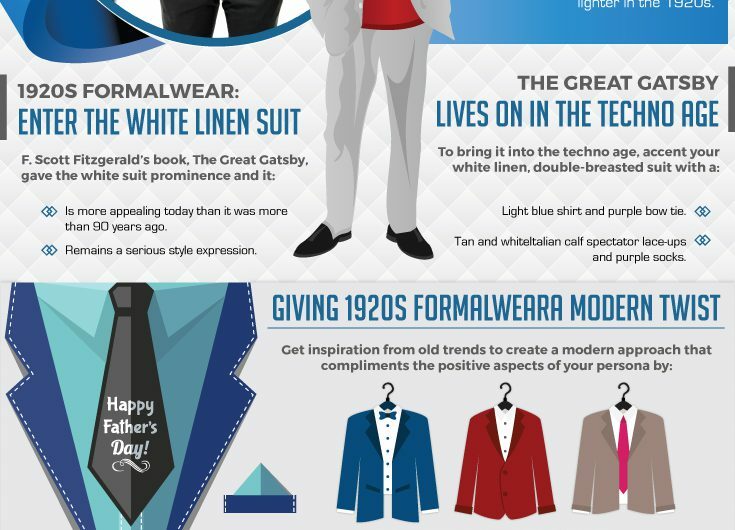 A white linen, double-breasted suit, with a light blue collared shirt, and purple bow tie shows the world that Gatsby still lives on in the techno age. A pair of tan and white, Italian calf spectator lace-ups, and a pair of thin purple socks adds a pop of color, as well as distinction, to any white suit. Even the three-button white linen suit gives people the signal that manly elegance is at home on the shore, as well as in the city. The important thing to remember when adopting the 1920s style in a contemporary suit statement is to get inspiration from the old trends. Use them to create a modern approach that flatters and compliments the positive aspects of your persona. That means leaving the heavy summer fabrics in the past. 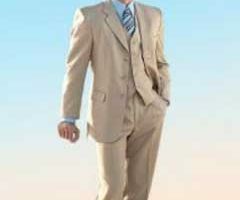 This is the age of lightweight wool, cotton, and linen, and those fabrics rock any style of white suit. Give your contemporary white suit the accents it needs to tell your style story. A two-button white suit jacket looks crisp and fresh with a pair of jeans and athletically-inspired wing tips. White linen suit pants rock with a navy-blue blazer, and an open collar, white shirt during a fourth of July celebration. 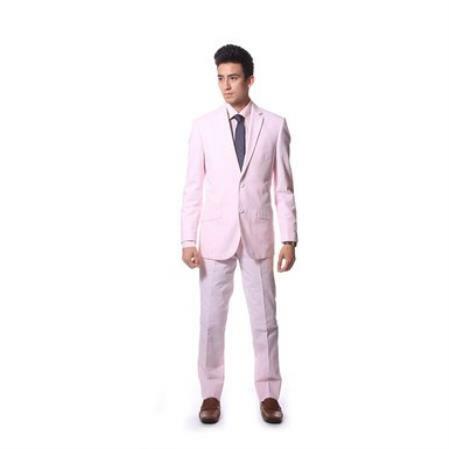 The versatility of a white suit gives men lots of options during the summer months. 1920s formalwear is not a historic part of fashion left in the past. The Great Gatsby white suit is not just the memory of a fictional character who was a cult figure for the rich and powerful. Men are still giving the white suit the credit it deserves every time they walk into a formal party or attend a social event. They have the same Leo Dicaprio look as when he put on his white Gatsby suit for the movie.